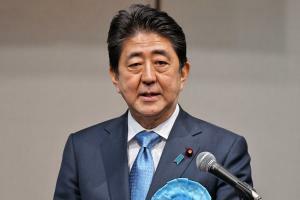 Sept. 25 (UPI) — Japanese Prime Minister Shinzo Abe on Monday announced that the government’s lower house of parliament will dissolve this week — and replacement elections will be held next month. The 475-seat House of Representatives will be dissolved Thursday, Abe announced, and campaigns to refill them will start Oct. 10 — and elections are reportedly set for Oct. 22. Abe set the breakup of the powerful lower house of parliament for Thursday because that’s when lawmakers return from a three-month summer recess. Japan must hold the voting before the end of next year, but Abe has likely decided on the snap election to capitalize on his Liberal Democratic Party’s two-thirds majority, with a coalition partner, in the House. Monday, Abe said the decision to dissolve parliament was aimed at resolving a “national crisis” that stems from rising tensions with North Korea. Abe’s administration has rebounded recently from low opinion ratings following a summer political scandal. It has been helped, the party believes, by Abe’s alignment with U.S. President Donald Trump in opposing North Korea in its development of nuclear missile capability. Among the priorities of Abe’s government is the removal of Japan’s fiscal deficit by 2020 through an increase in a consumption tax. Some members of his party advocate using the extra revenue to enhance social programs, like those offered to help children. The election will likely delay the attempt to restore Japan’s fiscal stability. The political scandals sent Abe’s approval rating to a low of about 30 percent. It has since recovered to between 40 and 50 percent. Because of the election, Finance Minister Taro Aso will likely forego the meeting of G20 finance ministers in Washington next month. Aso, who also serves as deputy prime minister, plans to attend a round of economic talks with U.S. Vice president Mike Pence on Oct. 16, the Japan Times reported Monday.